Buy Ricola Swiss Herbal Sweets Elderflower - 45g in the UK from our online shop or directly from our independent Scottish store. In addition to the unique delicious flavour, Elderflower was traditionally an important and popular medicinal remedy. In addition to the unique delicious flavour, Elderflower was traditionally an important and popular medicinal remedy: Elderflower is still used to speed up the recovery process. Ricola Elderflower herbal sweets are a mouthwateringly good and refreshing taste experience. Where can you buy real Ricola Elderflower 45g safely online? 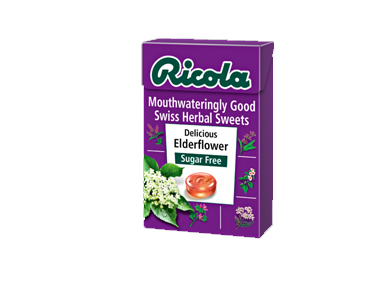 If you are wondering where you can buy Ricola Swiss Herbal Sweets Elderflower - 45g safely online in the UK, then shop with us. Ricola Elderflower 45g - Ricola Swiss Herbal Sweets Elderflower - 45g in Sweets and Confectionery.